It takes only about 45 minutes to travel from Tai Po Market to Tai Mei Tuk by public transport and another 10-minute walk to reach the main dam of the Plover Cove Reservoir. The main dam is a nice place for cycling at daytime. While at night, it is a hotspot for stargazing. Although the western sky is adversely affected by light pollution from Tolo Highway, the environment in the east is suitable for stargazing. Various means of transport are still available for return trip before 11pm. Tai Hang Tun has a comfortable and beautiful environment, as well as good hygiene facilities. 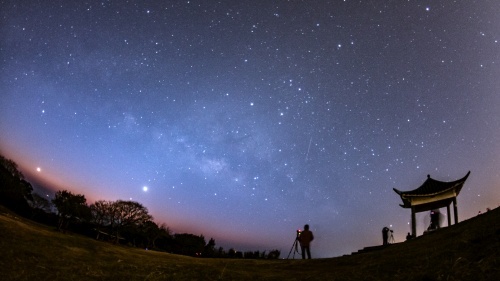 The site is adversely affected by light pollution from the urban area in the west, but the environments in other directions are suitable for stargazing. Sometimes, a lot of boats are moored at the sea nearby. The light they produced will seriously affect the stargazing conditions in the east. There is a car park in Tai Hang Tum. If you go there by bus, you should get off at Tai Au Mun station and it will take a 30-minute walk to reach the Tai Hang Tun Kite Course from the Tai Au Mun station. © Copyright 2016 STARGAZING CAMP COMMITTEE All right reserved.